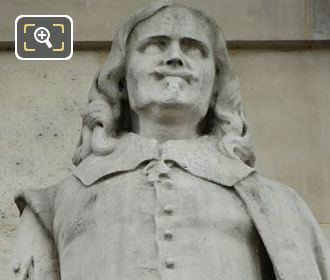 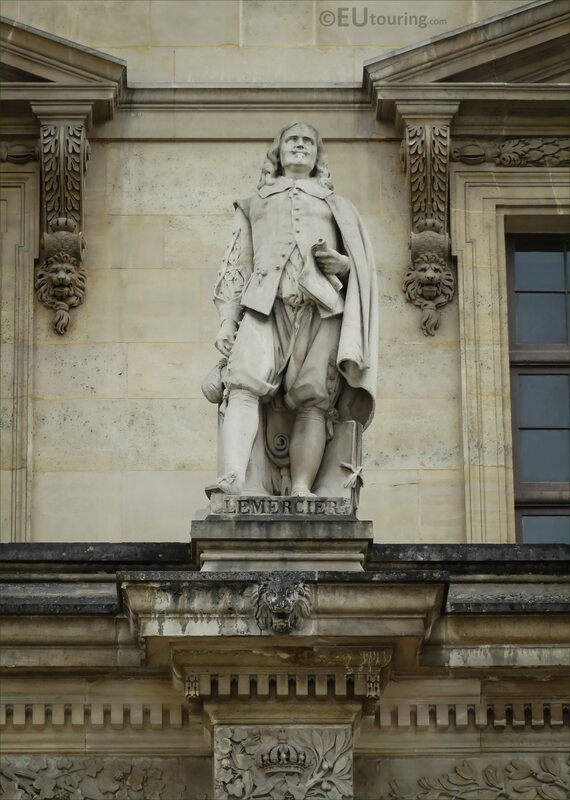 These high definition photos show another statue on the Aile Daru wing of the Palais du Louvre in the 1st Arrondissement, which is dedicated to Jacques Lemercier and was sculpted by Anotoine Laurent Danton. 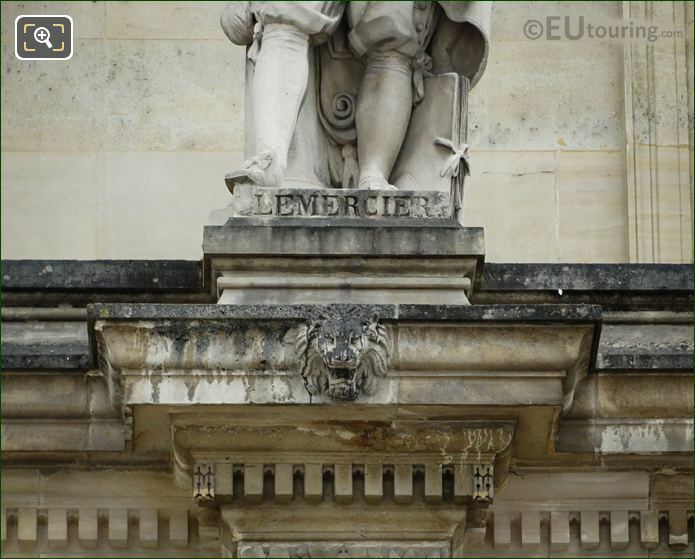 So this first HD photo shows the statue of Lemercier that is located in between the windows on the first level balustrade of the Aile Daru facade, and this is positioned second from the left as though you are looking at the wing from the Cour Napoleon, and it was put in place in 1857. Here you can see a closer view of the statue with its fine detailing that was produced by Antoine Laurent Danton who was born in Saint-Cloud in 1798 and became a French sculptor, winning the Prix de Rome in 1828, yet because he had a younger brother who was also a sculptor, he was known as Danton the Elder. And in this last photograph showing the plaque at the base of the stone statue, you can see that it is dedicated to Jacques Lemercier who was born in 1585 in Pontoise to a master mason, and became an architect and engineer, working on bridges in Italy for a few years before his return to France where he became Architect to the King, and was one of the three influential architects of the time. 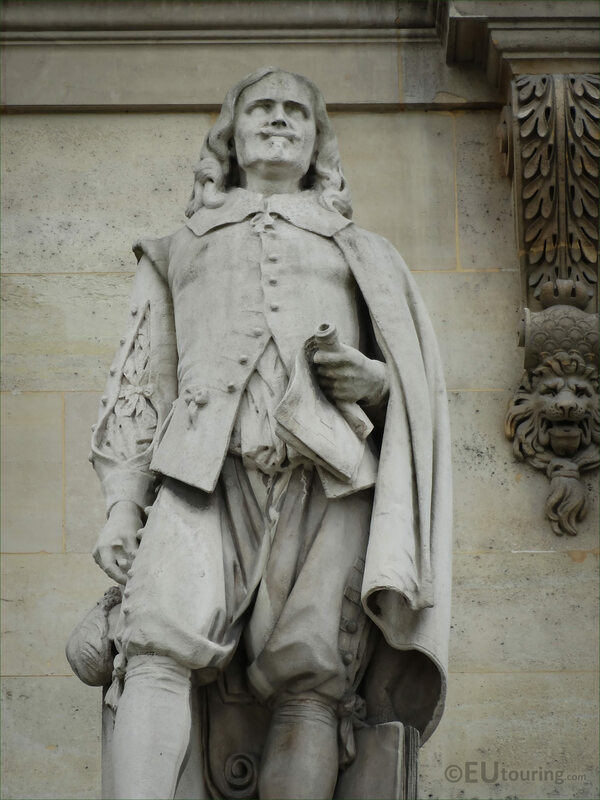 In fact, Lemercier worked on numerous projects including the Pavillon de l'Horlodge, or Pavillon Sully as it is also known, which is a wing of the Palais du Louvre, along with the Dome church at the Sorbonne, which was the first of its kind in France, but his last major project was the design of Saint-Roch church, with the cornerstone being laid by Louis XIV in 1653 prior to Jacques Lemercier passing away in Paris in 1654.